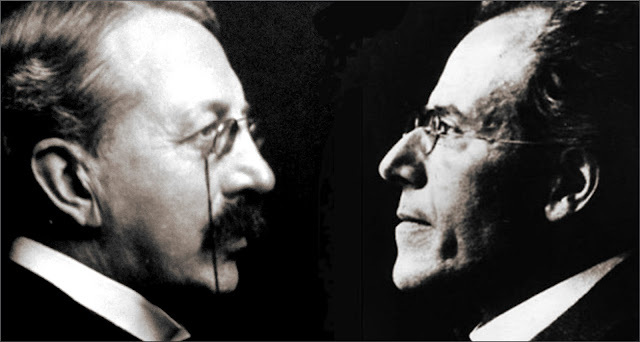 On the left is Charles Villiers Stanford. In 1910 Gustav Mahler conducted Stanford's Symphony No. 3 'Irish' in New York. Twenty-two years earlier the symphony had been played during the first season of the new Concertguebouw in Amsterdam*, and it was also conducted by Hans Bulow in Hamburg and Berlin and championed by Hans Richter. Yet quite inexplicably Stanford's Irish Symphony has only been played once at the Proms, and that was in 1895. Moreover none of Stanford's other six symphonies have ever had Proms outings. The right of life is stronger than the most sublime art, and even if we reached agreement on the fact that now the best and most beautiful has been achieved, mankind thirsting more for life and adventure than perception, would rise and shout in one voice: give us something else, give us something new, indeed for Heaven's sake give us Stanford's 'Irish' Symphony, and let us feel that we are still alive, instead of constantly going around in deedless admiration for my First Symphony. * Many influential commentators, including Lewis Foreman in the Chandos booklet, state that Stanford's Irish Symphony was played at the opening concert of the Concertgebouw in 1888. This has passed into classical music folklore but is wrong. The Concertgebouw opening concert took place on 11 April 1888, and the programme was Beethoven, Bach and Sweelinck. Stanford's Irish Symphony was played in the Concertgebouw on 3 November 1888 for a different but still very distinguished occasion, the first concert of the newly-formed Concertgebouw Orchestra conducted by Willem Kes. Loved this morning's post. I had the distinct pleasure of performing the "Irish" Symphony last spring. The work was unknown to the orchestra, but they absolutely loved the music right away, as did the enthusiastic audience in attendance at the concert. Coincidentally, Handley's Stanford cycle is next to my desk right now as I've been listening to the later symphonies. The sixth and seventh symphonies are great and serious works; there isn't a superfluous bar in either of them. The only thing standing in the way of these symphonies true popularity is the frequency of performance. I'd do what I could if only the Proms would call!